We left Saturday afternoon, headed for the Walmart in Waltersboro, SC, where we met up with our daughter, son-in-law and granddaughter; spent the night and arrived the next day at Fort Wilderness, Disney World, FL. This was our Christmas present to our granddaughter. For the next five days we wore ourselves out making sure we got our moneys worth. We all had a great time. My granddaughter made me proud by riding “Tower of Terror” twice! They left for home and we headed over to KARS Park in Titusville, where we spend 9 days camped on the Banana River, watching the cruise ships come and go. We were camped here with our good friends Rick and Becky. She got us tickets to tour the Kennedy Space Center, where we were able to see the shuttle Endeavor sitting on the launch pad. We continued our westward travels and drove up to Ft. Pickens National Park, located within Gulf Shores National Seashore for a couple of nights. It was a nice campground located at the west end on the island as part of the entrance to Pensacola Bay. They are absolutely correct when they call it white sugar sand. It looked like we were driving through drifts of snow getting there. It also helped in the fact the temperatures were COLD! While there we toured Fort Pickens, which was actually a Union Fort, build by slave labor in 1834! The Indian Chief Geronimo was sent here for a while during his imprisonment. We also headed over to Pensacola to tour the National Naval Aviation Museum. All I can say is WOW! We were not even close to seeing half of it before it closed for the day. We are going to have to go back again someday. Very impressive! Once again, we were on the move, this time for Rainbow Plantation, an Escapees Park. Again, it was only a short ride about an hour and a half. Located in Summerdale, Alabama, it is on the east side of Mobile Bay. This is where we spent Christmas! Bob and I went to a candlelight service at Grace Lutheran Church in Gulf Shores on Christmas Eve. On Christmas Day, we took a covered dish to share with our assigned table where we had ham as our entrée with four other couples where a good time was had by all. The weather has been bitterly cold and very windy for the last couple of days. Our water pipe froze up on Monday night. We were not hooked up so we were okay. It’s finally starting to warm up. We have gotten caught up on our laundry and went sightseeing over to Mobile where we toured the battleship USS Alabama and the USS Drum submarine. They have an impressive set up and also have more aircraft to see. 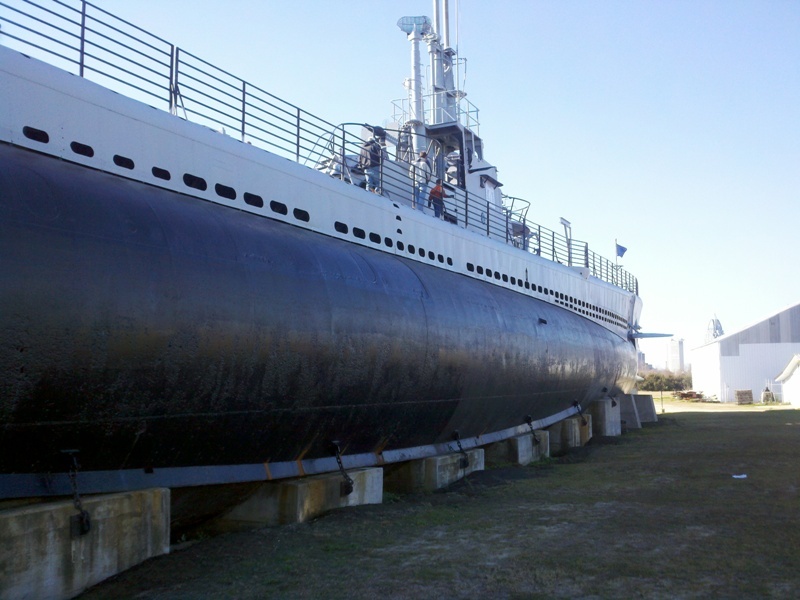 But the USS North Carolina (BB55) in Wilmington, NC, is much more impressive and is in better shape. Since this is the last day we will have full hookups for a while, we took the opportunity to finish a few chores while we still have the chance. Bob also was able to meet some of the people that write blogs that he follows faithfully. Meeting fellow RV’ers is always like greeting old friends, because they are. 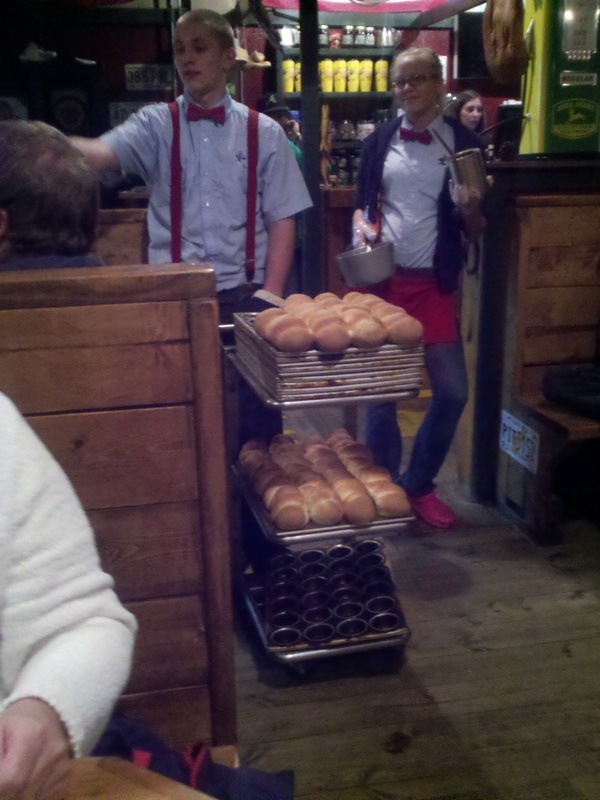 For dinner we just had to try Lambert’s Café, home of the “throwed rolls.” Oh my gosh! So much food! What a bargain, and good food to boot! We both ordered the Country Fried Steak with mashed potatoes. Then the feeding frenzy begins. They come around with hot rolls; raise your hand, they throw you a roll (5 inches across), and hot fried okra, they treat like an appetizer and put spoonfuls on your napkin. Your dinner comes, and the other food KEEPS on coming! More okra, more rolls, black eyed peas, cabbage, sorghum and molasses for your rolls; fried potatoes and onions, macaroni and tomatoes. That’s all we got, we may have missed something, I’m not quite sure. The steak was humongous! Our take home was enough for tomorrow’s meal. We were really hurting when we left Lambert’s. I give it a 5 of 5! We will be going back someday! Today we are off, headed for Houston, TX, to meet up with our RVing buddies, Patsy and Roy. We spent time with them in Quartzsite last year. We crossed what was left of Alabama, as well as Mississippi, Louisiana and on into Texas. Long day, but we arrived safely at our destination. (Sorry Bob, we didn’t have the time to stop at Bozo’s). Today is our daughter, Stephanie’s birthday. She will be celebrating with friends as well as celebrating New Year’s Eve!!! Happy Birthday, Stephanie! ! ! We rode down to PPL RV Sales and Parts and Service. Bob needed to get some parts for our toilet. Nothing serious I assure you, but we did look at some new ones. Patsy and Roy got a big kick out of my intense interest in toilet bowls! They had quite a selection on display for us to look at and sit on!!! Comfort is a big concern, LOL! We looked at some used RV’s, had some nice ones out on the lot. Hey John, they had a 2008 American Eagle that had just been sold so we couldn’t get in it, but is sure was pretty on the outside. Patsy and Roy were real curious too. Rick, I’m sure you can find a bargain here. They took us out to dinner at Mi Rancho Bar and Grille. Fabulous! It’s some of the best Mexican food I have ever eaten. Not your usual Mexican café for sure. We celebrated New Year’s Eve at home with Patsy & Roy drinking Champagne Royales in Tillie’s honor! We even went out and bought the lemons and I provided the zester! Patsy cooked up beans and cabbage and cornbread which we ate at Midnight! Happy New Year everyone! May you all have a happy, healthy and wealthy New Year!